A current postgraduate Law student here at University of Kent needs support with a short project she is working on that involves vlogs, podcasts and video shoots. The v-log, or podcast, or video would be a way to lead people to go to the blog. It does not have to be very technical or graphic, but professional and well projected would be great. If any student would be interested in working with Beattie to produce this project, please use her contact details below for more information. A local primary school to the University is working on a 2 week project to film high quality online safety videos, created by the school’s children. The videos will be submitted to the local council to hopefully be used to educate children and parents about their safety. The project begins Monday 9th October. 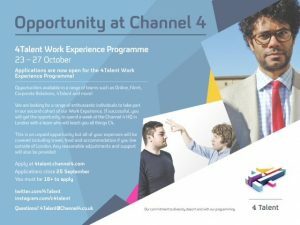 Channel 4 Work Experience – Applications now open! Channel 4 are now recruiting for their cohort of Work Experience! The Work Experience will take place from the 23rd– 27th October, and will be available in teams such as Film4, Corporate Relations, Online and more! Please note this opportunity is only for those who are 18+ and applications close on the 25th September and cannot be accepted after this date. The V&A Department of Theatre and Performance contains the UK’s National Collection of Performing Arts. The collections are vast, covering all areas of live performance – from theatre, opera and ballet, to music hall and musical theatre, circus, puppetry, and rock and pop. · Departmental activity is divided into collections work (based at Blythe House, Olympia) and exhibitions, events and publications (based at V&A South Kensington). · Exhibitions-based work includes the development of temporary displays in the Theatre and Performance Galleries at the V&A and a broad programme of special exhibitions, both at the V&A and on tour, and running various special performance-related events. · The Exhibitions side of the Department offers a small number of volunteer and graduate placements for career development, training and research. · Placements are available in the following areas: Research and interpretation, Exhibition development and Performance events and programming. · Volunteers have access to professional development training and experience, both at the V&A and at other relevant institutions and organisations in London, such as theatres, museums and other arts institutions. · Work is varied and rewarding, and allows volunteers to contribute to the work of one of the UK’s flagship cultural institutions. · The next placements will start on 2 October 2017 and run for approximately six months. (Please note that different projects require different time commitments). Applications – If you are interested in volunteering, please complete the application form overleaf and then send this to t.applications@vam.ac.uk. The deadline for applications is 17 September 2017. 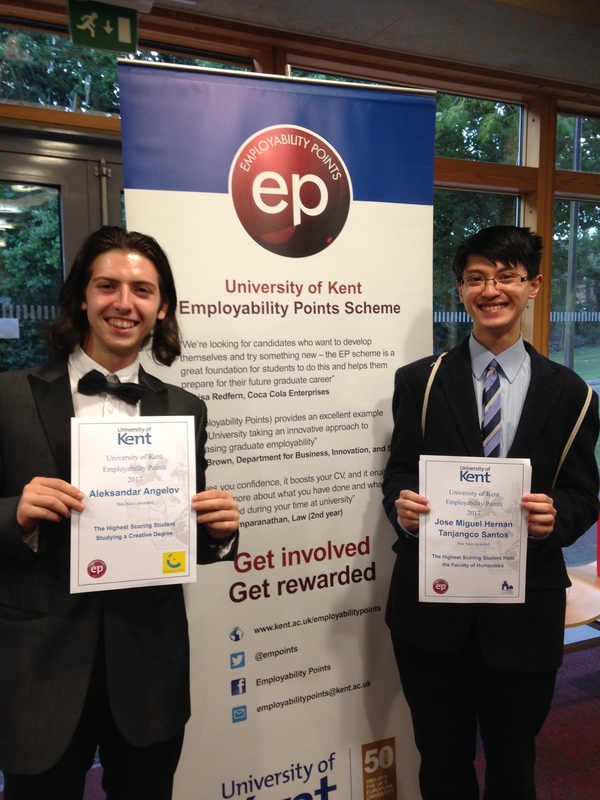 Students from the School of Arts were winners at the University’s annual Employability Points Rewards night on Tuesday 6th June. The scheme, pioneered at the University of Kent, allows students to claim points and rewards for their extra-curricular activities and is registering a higher number of students actively logging points and applying for rewards than ever before. These rewards include paid internships, project placements, work experience, training, vouchers and much more, offered by businesses and organisations, including many exciting opportunities in the arts. One of the winning students was first-year Drama student Aleksander Angelov, who won the prize for the Highest Scoring Student Studying a Creative Degree. Aleksander has earned a remarkable 1,695 points in his first year. He has immersed himself in University life, attending an impressive amount of Employability Festival Events with the Careers and Employability Service, as well as in-sessional English seminars with Kent’s Centre for English and World Languages, for which he became Course Rep. He has continued to improve his employability and skills through completing the Careers and Employability Award on Moodle and the Hub’s Enterprise Skills Award Module. He is the co-founder and President of the Bulgarian Society, as well as a member of the Homeless Outreach Society and T24 Drama Society. His award was presented by Dalia Halpern-Matthews, Chief Executive of Nucleus Arts. Second-year student Jose Miguel Santos (Drama & English and American Literature) was the Highest Scoring Student from the Faculty of Humanities and received his award from Colin Carmichael, Chief Executive of Canterbury City Council. Miguel has managed to obtain an outstanding 2,310 points whilst at the University of Kent. He has worked as a School of Arts mentor, regularly attended Careers and Employability service skills workshops, completed a range of Study Plus courses, acted as a Kent Student Certificate of Volunteering Champion, a Kent Buddy and a Student Trainer, delivering training sessions to student volunteers. His commitment to volunteering has led to being nominated the Kent Union Volunteer of the Month multiple times, as a result of undertaking various projects, including the Community Clean Up, a Canterbury Food Bank collection, a Shoebox Appeal, Age UK Christmas Tree project, to name a few. Notably, he was also involved with successfully writing a funding bid for the construction of an all-weather sports pitch for adults with learning difficulties. Miguel has successfully claimed four three-week professional placements across the summer as a result of his participation in the scheme. To find out more about the University of Kent’s Employability Points scheme click here.